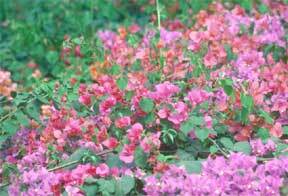 Recently, an email came in concerning our article on care and growing Bougainvillea. That statement prompted a reply from one of our readers in Canada. Here is what she said. We like emails like this as it shows what others experience growing their plants under completely different conditions. Thank you for your input. However, can I ask you a couple questions? Boug’s will bloom indoors… usually if they get lots of light, which most people do not possess. What are the conditions your indoor bougainvillea lives, grows and blooms in? Could you send some pictures of it? 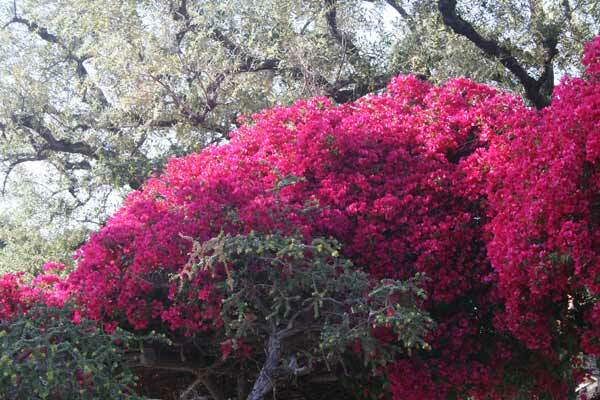 When caring for bougainvilleas – how often do you water and fertilize the plant indoors? Note: These are the type of questions required to find out how the plant is growing – good or bad or in diagnosing plant problems. My boug has had a few homes because I have been moving around traveling a lot lately so when I’m home I take it and when I’m away my sister takes it. So with the variety of homes, its has had a variety of environments. Sometimes it’s in a south window where it does get lots of sun but it also blooms well in a west window where it is now. It thrives with the late afternoon and evening setting sun. I water it well and thoroughly once a week but the roots never stand in water. During winter I water a little less because it’s dark here so I let it go a little dormant. I was checking out your website because my sister and I wanted to adjust the fertilizer now that we’re coming into spring and getting more sun. It has bloomed very well with the sun but it has also bloomed late in the fall when it gets less light and the sun is not as intense. My plant has been anywhere from over a 12 foot long vine full of blooms to cut right down to the main stem! My sister forgot about it one time and the soil completely dried out. So, as it was looking very sad, she decided to cut it back and see if it returned. Well it did!!! Magnificently! It grew fast and strong and back to 10 feet in no time. I recently returned home from living in Egypt for 8 months and bougs are everywhere. I can tell you, there, they have lots of sun but grow in dry sand with hardly any water. And it doesn’t rain there so any water the plants get are given to them by hand – not something people in Egypt spend a lot of time doing! I’m on the road right now so can’t send you a picture. Maybe I just have an indestructible plant that will thrive in most conditions whether you cut it back or not. It’s growing well again. I’ve had it for 10 years! So yes, light matters and food matters and so does love. But to say it only grows with lots of light just hasn’t been so for my experience. And I usually do follow the guidelines for each plant understanding full well they each have their likes and dislikes just like us! Thank you so much for your “in depth reply”… I must tell you, SOME PEOPLE just have a gift of growing plants. That is a gift of mine, and it sounds like you also have that special gift. However, plant care can be learned! The thing is… you are doing so many things right… making small adjustments, in watering and fertilizing, in the “environment” changes and you do not freak out! If you will allow me… let be give you a little insight into HOW we approach many of the articles and information at Plant-Care.com. Our goal is for Your SUCCESS with Plants. The first goal is for you as a visitor to hopefully gain the information you need to become successful with plants – both indoors or outdoors. If we can get you to be successful with a plant for 1 year then hopefully you can move forward and “experiment”… That is the true key to learning to grow plants… experimentation! The problem is… we receive 1000’s of emails which go something like this. That is why we recommend NOT trying a bougainvillea indoors. NOT because it will not grow or flower, it will as you have proven. However, until someone knows not to freak out when a leaf drops they just are not ready to take a bougainvillea (or almost any plant) and put it in conditions where their SUCCESS will be greatly reduced. Keep up the good job your are doing growing your Bougainvillea!